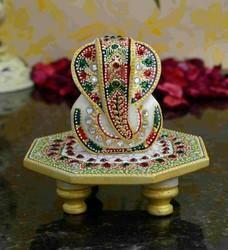 marbal choki ganesh choki size 4x4 and ganesh size is 2.2 inch pour hand made choki ganesh . Our organization is among the most important and prominent industries, engaged in presenting an extensive range of Choki ganesh. The offered Choki ganesh is crafted using high grade material, in accordance with quality standards under the supervision of skilled craftsmen offered Choki ganesh is known in the market due to its excellent finish & designs customers can avail this Choki ganesh from us at affordable rates.